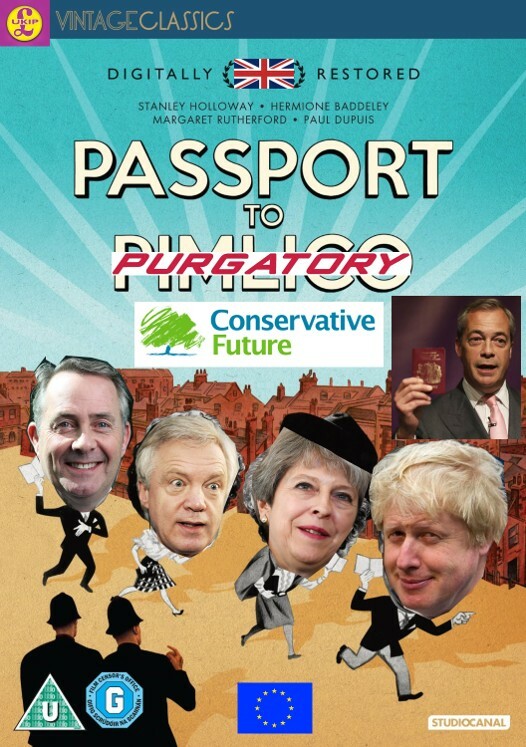 The British Gazette » Brexit: Passport to Purgatory? Many British Gazette readers will recall with a smile the 1949 Ealing comedy, Passport to Pimlico. It was of course very much a creation of it’s time set against a background reality of harsh post war rationing and the concomitant bureaucratic restrictions over large parts of people’s lives in Britain at the time. It was a gentle comic piece of escapist nonsense! In his offering today (http://eureferendum.com/blogview.aspx?blogno=86591), the estimable Dr. Richard North however does not deal at all gently with the darkly comic pieces of escapist nonsense that flow from the mouth of a certain Mr David Davis! Today’s article should be read as a Part Two of yesterday’s article (http://www.british-gazette.co.uk/2017/09/01/brexit-achieving-the-impossible/), it being Part One. This is because to write the two articles as one would have been far too long! Yesterday, we suggested that the Tories may be trying to achieve a fait accompli by allowing themselves be be manoeuvred by the Unfortunate Trio of Comrade Corbyn, Nicola Sturgeon and Sir Vince of that Cable into remaining within the EEA post Brexit. It is a political feint that would have brought forth the admiration of Niccolò di Bernardo dei Machiavelli, had not this wily and shrewd politician of the Florentine Republic had realised that such a manoeuvre would land it’s schemers in an even greater mess! This is because to call the Tory stratagem (if that is what it is) as reckless is to do it an immense kindness it frankly is not deserving of. Mindbogglingly stupid would be a justifiable description of it. Why? We hear some of you ask. Because for it to be effective the fait accompli requires the unprotesting acceptance of the EU! Whilst the UK can grasp the apparent opportunity that lies in the treaties it has signed up to, for it to be effective, it requires the acceptance of the other parties. Whilst it now appears that the UK may be able to walk away with no deal on the RAL payments (the so called “divorce settlement”) and still find itself in the single market, getting the EU and it’s remaining 27 members to accept this is another thing entirely! Before we detail the likely consequences of the fait accompli, allow us to detail just how this situation has come about. There are two significant treaties: The Single European Act and the Lisbon Treaty. The Single European Act (SEA) was the first major revision of the 1957 Treaty of Rome. The Act set the European Community an objective of establishing a single market by 31st December 1992, and codified European Political Cooperation, the forerunner of the European Union’s Common Foreign and Security Policy. It was signed at Luxembourg on 17th February 1986, and at The Hague on 28th February 1986. It came into effect on 1st July 1987, under the Delors Commission. The Treaty of Lisbon (initially known as the Reform Treaty) is an international agreement which amends the two treaties which form the constitutional basis of the European Union (EU). The Treaty of Lisbon was signed by the EU member states on 13th December 2007, and entered into force on 1st December 2009. It amends the Maastricht Treaty (1993), known in updated form as the Treaty on European Union (2007) or TEU, and the Treaty of Rome (1957), known in updated form as the Treaty on the Functioning of the European Union (2007) or TFEU. It also amends the attached treaty protocols as well as the Treaty establishing the European Atomic Energy Community (EURATOM). The European Economic Area grew out of the Single European Act. The Agreement on the European Economic Area, which entered into force on 1st January 1994, brings together the EU Member States and the three EEA EFTA States — Iceland, Liechtenstein and Norway — in a single market, referred to as the “Internal Market”. These things came into existence BEFORE the Treaty of Lisbon. The importance of this timing cannot be overstated. This is because BEFORE Lisbon came into effect the European Union and it’s earlier forms required the legal personalities and sovereign powers of it’s members to conclude treaties. Before Lisbon, the EU had no legal personality of it’s own or any treaty making sovereign power. Since Lisbon it has. What this means is this: The UK is a member of the EEA because it used it’s own sovereign power to place itself in it. Furthermore, Article 50 of the Lisbon Treaty is made effective by the EU’s own sovereign treaty enacting power. Thus when the UK enacted the act of withdrawal recently and set the clock ticking, Brexit was going to take place. Unless all parties agreed to it’s revocation. But IF the UK does not serve notice to quit the EEA, legally, it WILL remain in the EEA post Brexit. The May government would have you believe that this is the case. It is the British Gazette’s current understanding that this is not the case. Serving notice to quit the EEA WILL require an Act of Parliament. The reason is enshrined in the key documents of the British Constitution. These are the 1688 Declaration of Rights and it’s ratifying statute, the 1689 Bill of Rights. These documents require the Sovereign to obtain the consent of Parliament (defined as the House of Lords and the House of Commons) for any Act or amendment, suspension or repeal of an Act. Where a treaty (or its revocation) has the effect of an Act of Parliament, it too requires the consent of Parliament. Thus the Tories will HAVE to place such as the European Economic Area (Withdrawal) Bill before Parliament. If Mrs May does not do this voluntarily, it is likely that the Supreme Court will instruct her to do so, presumably following the actions of a plaintiff such as Gina Miller! The chances of the Tories getting such a Bill through are remote. Even if they manage to cajole enough Tory MPs, the House of Lords appears destined to reject it. So, what will be the result of a “No Deal” or Artcile 50 timed-out Brexit + EEA membership retention look like? Well, Tory ministers said they wanted a unique British Solution! - The EU and it’s twenty seven member states will be in the EEA subject to the jurisdiction of the ECJ. - Iceland, Liechtenstein and Norway will be in the EEA subject to the jurisdiction of the EFTA court. - the UK will be in the EEA subject to the jurisdiction of the Supreme Court of the United Kingdom. To say that the EU will not accept this state of affairs is as obvious as saying that the President of Mexico, Enrique Peña Nieto does not agree with Donald Trump vis-à-vis “The Wall”! 1. Payment of the RAL – possibly as high as £100 Billion! 2. Acceptance of the jurisdiction of the ECJ! You’ll be paying for it. Heavily! Of course, had the Tories followed Dr. North’s advice and had immediately notified the EU that the UK would first request EFTA to agree upon the UK rejoining it upon Brexit preparatory to submitting Article 50 notification and making it clear that it would be continuing it’s membership of the EEA, but as an EFTA member, the bill for the RAL would have been a great deal lower than £100 billion. Probably below £30 billion. Hey ho! You casts your vote and pays your taxes!